This morning I had an intense chocolate craving. So…I made a little treat for the special boys in my life. Oh, okay. They may have been for me, too. 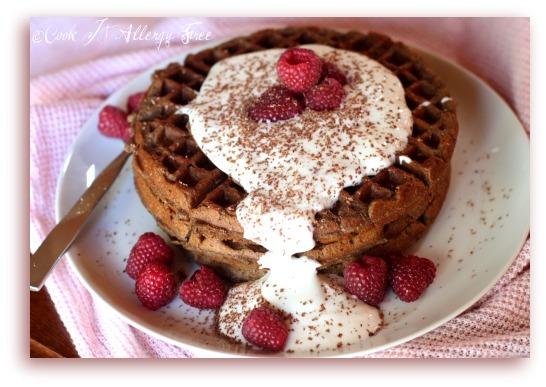 I knew that they would not be able to resist these Gluten Free Dairy Free Chocolate Waffles. The generous part of me knew it would be a fun surprise for them to start off their Valentine’s Day weekend. The selfish part of me was just trying to satiate my own aching sweet tooth. Either way, these were a huge hit and a home run. I was about a second too late to catch a photo of my three year old licking the vanilla yogurt dusted with chocolate shavings off of his plate. He is not one to leave any part of a good thing. This morning was no exception. I think I almost caught my husband doing the same thing as his pint-sized son. He looked awfully guilty about something as he put his all-too-clean plate in the dishwasher (okay, I wish) in the sink. These sound a lot more naughty than they really are. There are definitely some redeeming nutritional qualities about them so that you do not have to feel too guilty as you fill your family up with this breakfast specialty. So the next time you have that chocolate craving hit you before you have even had your first cup of coffee, these waffles just might be the answer to satisfy it. 1. In medium bowl, sift together all-purpose flour blend, almond flour, buckwheat flour, cocoa, baking powder, baking soda, and sea salt. Once blended, mix in the sugar. 2. In another bowl, whisk together egg yolks (or egg substitute), milk of choice (dairy-free or dairy), and oil (or melted Vegan butter, or dairy butter). Combine until smooth. 3. Add the wet ingredients to the dry ingredients and gently fold until just incorporated (do not over-mix). 4. If using eggs, in separate bowl, using a hand mixer, beat whites until soft peaks form. Then gently fold whites into the blended batter. Again, do not over-mix. You do not want to deflate your batter. 5. Let batter sit for five minutes while allowing your waffle iron to heat up. Make sure to brush the waffle grates with oil. For a 7 inch round waffle iron, add about 2/3 cups of batter to the center and quickly spread. Close lid and cook according to iron directions. 6. Serve topped with Dairy-free (or dairy) vanilla yogurt and semi-sweet chocolate shavings (or maple syrup, or chocolate syrup, or caramel sauce, or whipped cream….). This is what my boys licked off of their plates – it was their favorite part. Happy Valentine’s Day, my faithful Cook It Allergy Free friends. We will be at home enjoying a dinner of King Crab Legs with the family (Nana, Papa, Auntie, and Cousins) since we do not like to hit up the restaurants on this crazy night. What do you do on Valentine’s Day? Yes – please, thank you. My, those look so decadent and naughty, but I knew they would be good for us too with you on the job. I can just picture your guys cleaning their plates. We stay in and make dinner at home and eats lots of chocolate. Boring, but gluten-free! Happy Valentine’s Day! Those look wonderful and get the cooking wheels in my mind turning. Thanks, Iris! By the way, thanks so much for adding me to your blogroll! You are on mine ;0)! Those look sinfully delicious! I am going to get some more So Delicious coconut milk yogurt today. I think I’ll try using the vanilla flavor! Yum Kim, these look so delicious. I’m totally bummed that our waffle maker conked out last week. We must get another one soon! Alisa, bummer about that waffle maker! I actually like making waffles better than pancakes because it seems to go so much faster (and the batters are not really that different). Hope you had a great V-Day! Eating out on Valentine’s Day is almost never a good experience … restaurants are not at their best with massive crowds of folks who are often grumpy from waiting and unmet expectations. LOL Home is best. Tonight was just roasted chicken, baked potatoes, and green beans for us. Saving the rest for this weekend! And, for the record, you can come be a kid in my house ANY time you want! Wow! Those look soooooooooooooo delicious! Thanks for sharing! Thanks, Stephanie!! Hope you are feeling better and having a great week! Looks yummy! I have a question about the sugar, in Australia we can get palm sugar in soft moist dark brown cylinders or in hard yellow tablets. Is the one you use different again from these? Hi InTolerantChef! I have not seen palm sugar in cylinders or tablets before – mine comes in a bag and is just like loose sugar granules. But, I would think that as long as you can dissolve it somehow, it would work fine. You can also just use brown sugar in this recipe too, though (have done that before as well)!! Why oh why do I live so far from you. I would volunteer to be your taste tester any day. I got a new waffle iron and now I know what I’m making first. Holy cow, these look spectacular!!!!! Thanks, Jess! By the way, that artichoke pizza of yours for day 9 looks absolutely amazing (left a comment, but most likely in Spam as usual). Lucky kids to be welcomed by this in the morning! My little guys keep asking for homemade waffles. Need to invest in a waffle iron, now that I’ve seen this. Yum! I don’t believe in guilt, especially when it comes to food. It’s such a joy to share a treat like this with your family. What a great recipe. Thanks for sharing with the Hearth and Soul hop. Good Point, butterpoweredbike! There should be no guilt involved with food! Thanks for letting me share it with Hearth and Soul this week! Oh, you little devil you. These look scrump-sh-lee-oh-so! Do I have to wait until next Valentine’s Day to try them???? 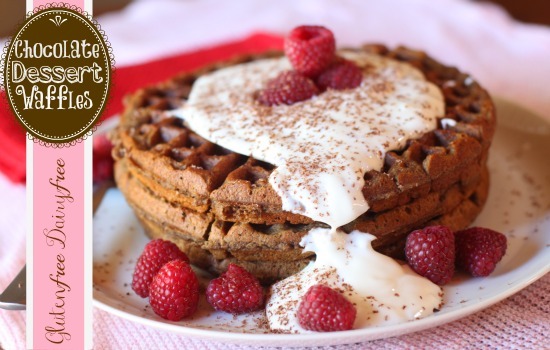 Wow, these waffles look and sound healthy and delicious! Don’t think I’ll miss the gluten or dairy at all. These look absolutely delicious! I cannot wait to try them. The mix of ingredients already proves they’ll be tasty! It never hurts to have a tempting dish like this….especially around V-Day. I really shouldn’t be commenting this close to meal time! Wow that looks good!! Thanks for sharing at the hearth and soul hop this week. I fixed my husband these waffles this morning and he said they are the BEST waffles ever! I used ground pecans for the almond flour and brown rice flour for the buckwheat. Rebecca, I just have to tell you that comments like this literally make my entire day!!! This is the best compliment ever! I am SO happy that your husband liked them so much! And I can only imagine how delicious these would be with the pecan flour instead of the almond flour. I love love the slightly sweet flavor of pecans! 😉 Thanks for coming back and letting me know these were such a success!! I made them & they tasted absolutely FABULOUS, my friend! The ingredients are great. Since I don’t have a waffle maker, do you think I can make the batter as a pancake batter? HI Yvonne! If you make these as pancakes, I would add a bit more liquid to the recipe (maybe 1/4 cup or more) so that the batter is more pourable. I have not tried it this way yet so let me know if it works out for you!